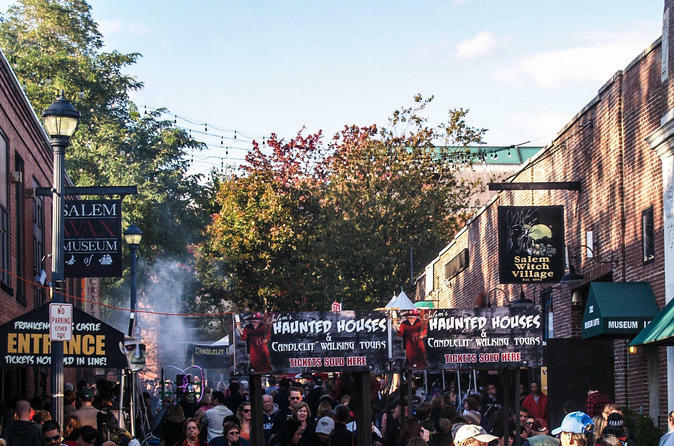 Experience two of Salem’s most fascinating and spooky attractions with this combo tour! Take a guided tour of the Salem Witch Village with a real practicing witch to learn about the myths and realities of witchcraft, and explore the Salem Wax Museum to come face-to-face with life-like replicas of Salem’s famous historical figures, such as the merciless Salem Witch Trials judge and Nathaniel Hawthorne, author of The Scarlet Letter. Nearby, visit Old Burying Point -- reputed as the second-oldest burial ground in the country – and stop by the Witch Trials Memorial to commemorate the victims of the Witchcraft Hysteria of 1692. Salem Wax Museum From its founding in 1626 through the terrifying Witchcraft Hysteria of 1692, Salem’s vivid history comes alive at the Salem Wax Museum, a compelling museum composed of eerily life-like wax figures. Come face to face with many notable Salem figures such as National Hawthorne, the famed author of The Scarlet Letter and The House of Seven Gables. Meet the pirates of New England, the merciless Witch Trials judge Colonel John Hawthorne, and Tituba, the accused 'witch' who helped fuel the hysteria -- just to name a few! From the galleries, head to the interactive area to learn about nautical knot tying, do grave stone rubbing on a recreated headstone, and experience what detention during the Hysteria felt like by being locked in a life-size, recreated jail cell! Afterwards, be sure to visit the impressive museum gift shop, where you can browse a variety of New England maritime souvenirs. Salem Witch Village Across the street from the Salem Wax Museum is the Salem Witch Village. On your 15-minute guided tour of this historical attraction, immerse yourself in the history of witchcraft in Salem as you learn the difference between myths and realities of witchcraft in both the ancient and modern world. Your tour guide, who is a practicing witch, will take you through an indoor maze and demonstrate scenes that mark important landmarks in witchcraft history. Hear about the origin of stereotypes such as devil worship, flying on brooms and black cats, and learn about the different persecution periods such as the Salem Witch Trials and the Burning Times of Europe. Your guide will also clarify what it really means to be a witch today. You may be surprised what you learn! After your tour, browse the gift shop for authentic Pagan and Wiccan items and souvenirs. Don’t miss nearby Old Burying Point, reputed to be the second-oldest burial ground in the country. Also near here is the Witch Trials Memorial, erected in memory of the victims of the Witch Hysteria of 1692.